Since I had half a gallon of homemade yogurt to eat in a week (and eating it with honey for breakfast only goes so far), I thought I’d share a few ways I’ve used it so far. For the past few days, I’ve been making myself a hearty breakfast or lunch of green eggs and creamy polenta, and I would highly recommend it. 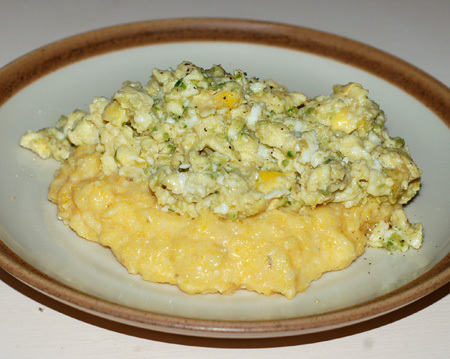 The eggs are just scrambled slowly until just set, then stirred together with a dollop of garlic scape pesto. Since the polenta was just for me, I made it in the microwave: 1/4 C with 1 C water, a tablespoon of butter and a pinch of salt, covered and nuked for 7-8 minutes. When it was done, I stirred in several tablespoons of yogurt for a creamier texture and a bit of tang. I doubt Jeremy would find it appealing, but I thought it was fantastic, not to mention filling. As soon as I discovered that the summer heat was finally showing itself in Oregon, my mind turned to frozen yogurt. 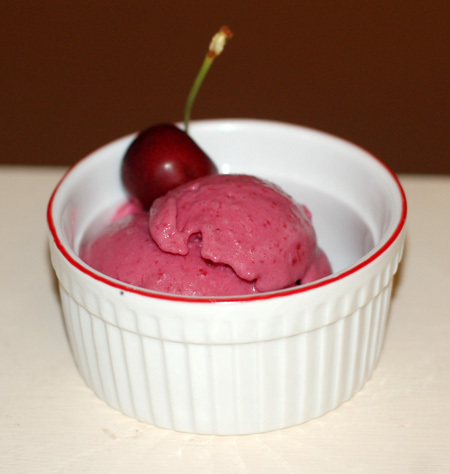 I used about half a cup of organic raspberries and a cup and a half of pitted cherries from the farmer’s market, heating them over medium low heat with about half a cup of sugar until they were completely soft and juicy. I pureed and strained them, and the next day, I stirred them into my homemade yogurt at about a 1:1 ratio and ran the ice cream machine. The result was an extremely refreshing, tangy, and eye-appealing dessert. Nolan spit out his first taste, vehemently, but ended up eating half my cup a few minutes later. That is a real victory because I am raising a child who pretty much only wants his fruit dried—he rejected bites of both the cherries and raspberries in their whole forms just days ago. 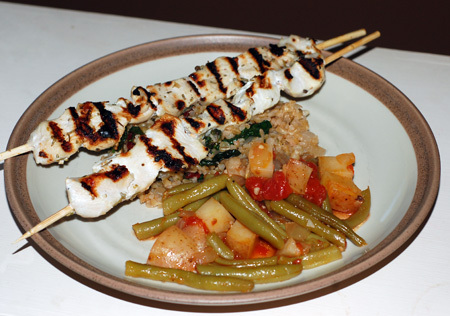 The main event yesterday was a Greek-inspired meal of chicken kebabs, bulgur pilaf and green beans with potatoes and tomato. The chicken kebabs were marinated for a few hours in a mixture of yogurt, garlic, lemon juice, oregano and rosemary; while they soaked, I got the green beans cooking, cooled off with a little frozen yogurt, and then came back to the pilaf, which incorporated onions, garlic, sauteed chard stems, and some wilted greens. Despite the heat in the kitchen, this was a fantastic meal. The yogurt makes a huge difference in the flavor and tenderness of the chicken, and the side dishes harmonized with it perfectly. Our little guy honed right in on the chicken and ate about two kebabs’ worth before he even looked at the rest of his plate; then he tucked into the bulgur and made such a mess that we went straight from the high chair to the bath tub, to remove it from his face, hair, hands, belly button and diaper. This post is linked up with Probiotics: Every Meal. Stir together everything but the chicken pieces in a container or Ziploc baggie; add the chicken and massage well to coat. Allow to marinate in the refrigerator for about 3 hours, turning the bag over or stirring through the container several times to make sure the chicken stays coated. When you are almost ready to cook the chicken, preheat the grill and start the bulgur pilaf. In a large saucepan, heat the olive oil over medium heat and saute the onion and garlic with a good pinch of salt until fragrant and tender. Add the bulgur and stir to coat, allowing the grain to toast for a few minutes. Then add the water or stock, stir once and bring to a simmer. Allow to cook for 20 minutes, until the liquid has been absorbed and the bulgur is tender. While the bulgur cooks, thread the chicken onto skewers and start grilling them. They should only need a few minutes on each side to cook through if you have cut the pieces small enough. Remove the thick stems from the greens; if you are using chard, reserve the stems and coarsely chop them (discard the stems of other greens). In a medium skillet, saute any chard stems with a splash of olive oil and salt until tender; meanwhile, rinse and thinly slice the greens. When the stems are tender, add the greens to the skillet with the lemon juice and another pinch of salt; saute, turning them over, until they have wilted, then stir the whole skilletful into the finished bulgur. 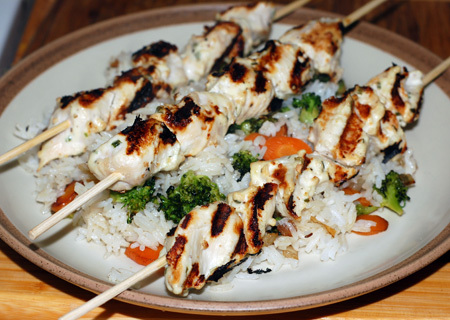 Note: The yogurt marinade for these chicken skewers is easily adaptable for a range of flavors. I have made an Indian-inspired version of this in the past, served over broccoli-carrot pulao. A Moroccan version would also be very tasty, but use your imagination. Yogurt is a great tenderizing addition to a marinade for virtually any meat—beef, pork, and lamb included—and the tougher the cut, the longer bath it can handle. Diana, glad to offer a little inspiration for your berries! Speaking of which, it’s still 95F out… time for a scoop before I plunge back into the heat to cook dinner!